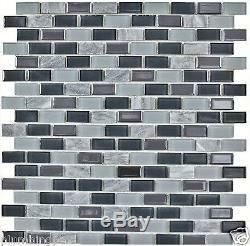 Brick Style Blue Grey Slate Marble, Polished & Frosted Glass Kitchen Bath Wall Mosaic Backsplash Tile. Note: Variations in color, shade, and tone are natural for all tiles and mosaics Colors may vary due to individual monitor profile settings. Ideal use for Kitchen, Bathroom, Walls, or Back Splash. Approx Sheet Size: 12" X 12". Approx Stone Size: 1-1/4" x 1/2" x 1/8. Stone Material: Polished & Textured Glass, Slate Stone. Colors: Navy, Light Blue, Grey. This listing is for a Box of 20 Sheets. All electric units in our stock are with current production dates. Our qualified staff works hard to make sure that all emails are answered in a timely fashion. The item "Brick Blue Glass, Slate Marble Kitchen Bath Wall Backsplash Mosaic Tiles- 20" is in sale since Thursday, January 22, 2015. This item is in the category "Home & Garden\Home Décor\Tile Art". The seller is "plumbingpex" and is located in Not Specified, NJ. This item can be shipped to United States.